Georgia (and the Masters) on my mind! General view of the Augusta National Golf Course. 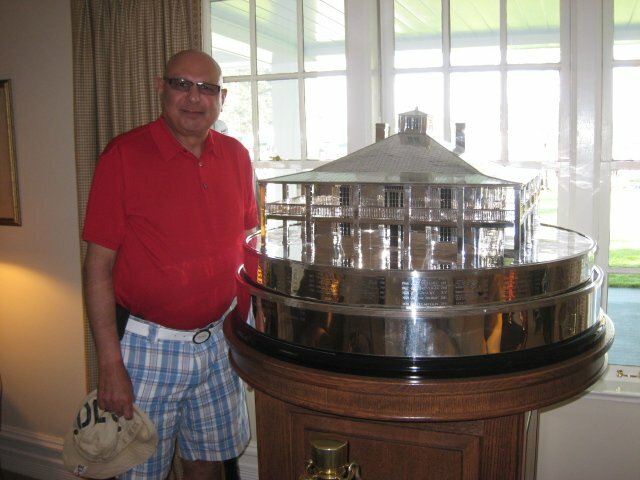 Noorali with the Masters trophy at the Augusta National Golf Club. 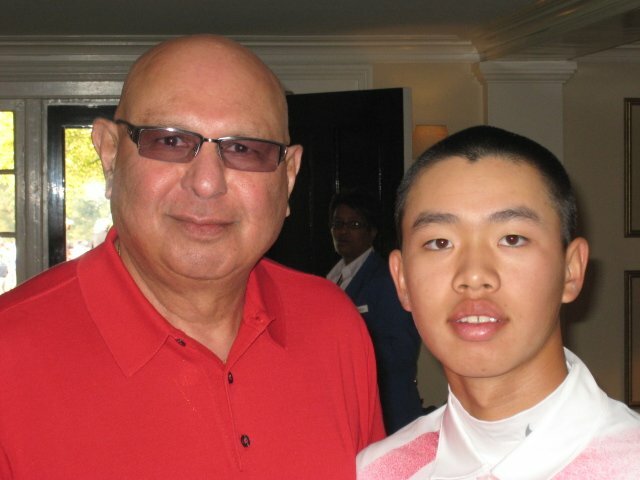 Noorali with Tianlang Guan from China, 14-yr-old eighth grader in school, the youngest player to play the Masters and make a cut. Kitchen encounter with “Mr. 59”. Al Geiberger. From L to R: Al Geiberger, Harry, Tony, Noorali, Dan. With Dave Stockton, short game guru and a well known American Golfer. From L to R: Noorali, Tony, Dave Stockton, Dan, Harry. 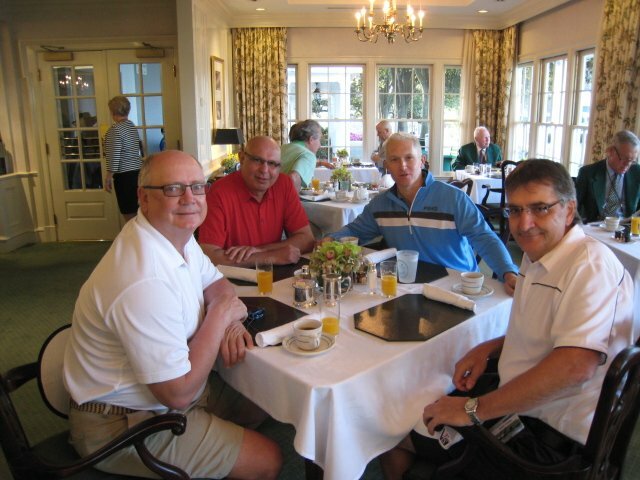 Having breakfast in the clubhouse – restricted to members and their guests. L to R: Harry, Noorali, Dan, Tony. 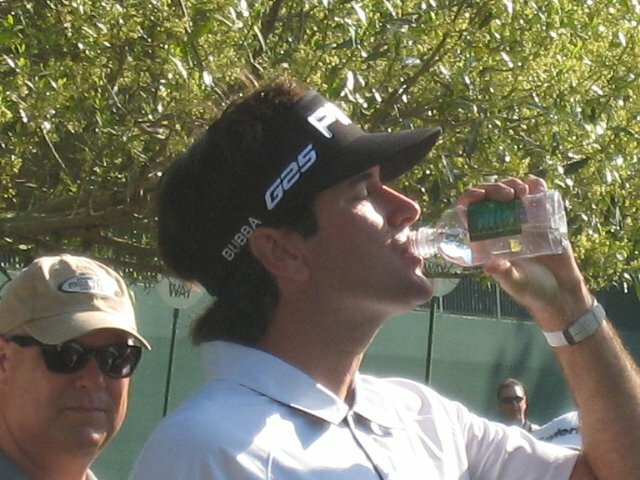 Bubba Watson – 2012 Masters champion quenching thirst during the Masters practice round before hitting his tee shot. 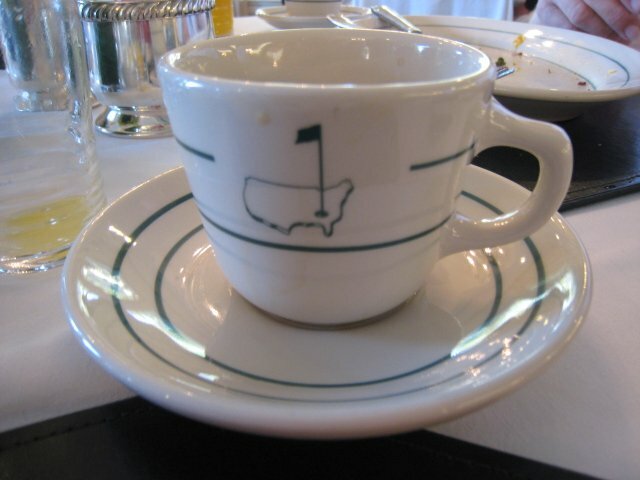 Augusta National Golf Club coffee cup and saucer. We (Tony, Dan and yours truly) arrived in Atlanta, Georgia on Friday April 5. We were picked up by our friend from Kentucky, Harry and drove to Reynolds Plantation in Greensboro, GA. We checked into our hotel, The Ritz-Carlton. Reynolds Plantation is a golf and lake community providing a lifestyle with six golf courses and access to Lake Oconee, Georgia’s second largest lake. It has 10,000 acres of land, four full service marinas and 90 miles of shoreline. 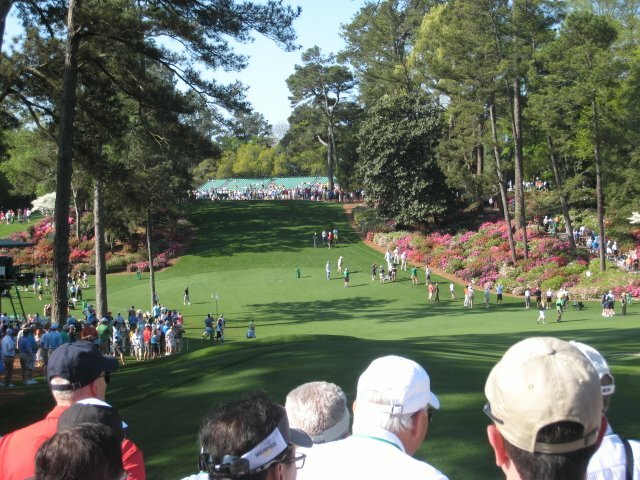 We had tickets to the Masters for Tuesday April 9 practice round and Thursday April 11, first day of the Masters. We had decided to golf for three days at Reynolds Plantation before going to Augusta. On Saturday we golfed at The National and Great Waters – 36 holes for the day. On Sunday we golfed The Plantation Course and Harbour Club. Monday we golfed in the morning at The Oconee and drove to Augusta in the afternoon. In Augusta, we were accommodated in a beautiful house by our host. On Tuesday, we were driven to the Augusta National Golf Club by our host who had special privileges at the Club House. We drove through the famous Magnolia Lane and then given a tour of the clubhouse. We had breakfast at the clubhouse where only members and their guests are allowed. We also had lunch on the lawn which is also a restricted area. We had our pictures taken with the Masters trophy which sits in the clubhouse. Practice round is the only day cameras and cellphones are allowed on the course. We had an opportunity to walk around the course, follow some famous golfers on the course, take hundreds of pictures of who’s who on the PGA tour, we had a group photo with Dave Stockton, the short game guru of many players including Phil Mickelson. In the evening we had a kitchen encounter in a private home with “Mr. 59” Al Geiberger and his two sons who are also well known in their own sporting fields. Al Geiberger, won eleven times on the PGA Tour, with victories that included one major championship, the 1966 PGA Championship. On June 10, 1977, in the second round of the Danny Thomas Memphis Classic played at the Colonial Country Club in Cordova, Tennessee, he became the first person in history to post a score of 59 (par was 72) in a PGA event. Incidentally, Dave Stockton was one of Geiberger’s playing partners that day. That Tuesday afternoon we were free so we booked a course (The River Golf Club) in North Augusta, South Carolina – a 45-minute drive from Augusta, GA. On Wednesday, April 10, we played 36 holes of golf at Palmetto Golf Club in Aiken, South Carolina. So, by that time we had played nine rounds of golf in five days – this is the most golfing I have done in five days. At the end of it I felt tired but rejuvenated that I still had stamina to do this amount of activity! A self vote of confidence – so to speak. Thursday was the big day – first day of the Masters. We arrived at the course at seven in the morning, first tee time was at eight. Parking is free near the course – about five minutes walk from one of the gates. We went through the security and carefully walked to 14 and 15 hole and put our chairs at the rope around the green. If you are found running then you will be thrown out. There are too many rules to take care of. No cell phones or cameras are allowed inside after Thursday. There are thousands of people, so if you part with the members of your group then you will have hard time contacting them. Once you put your chair down then nobody will move it. You can walk around and follow a group of golfers for a while. It is a long course. Every fairway has a hilly area to climb. When you are tired you can sit down and watch all the golfers go by. You can decide how you want to spend the day. I was thrilled to see all the players in person so closely from the ring side sit. It was a memorable moment. We returned home on Friday to watch the rest of the Masters on TV. Masters ticket are one of the most difficult to buy. You can go to their website and apply. You can buy them from a certified ticket broker. 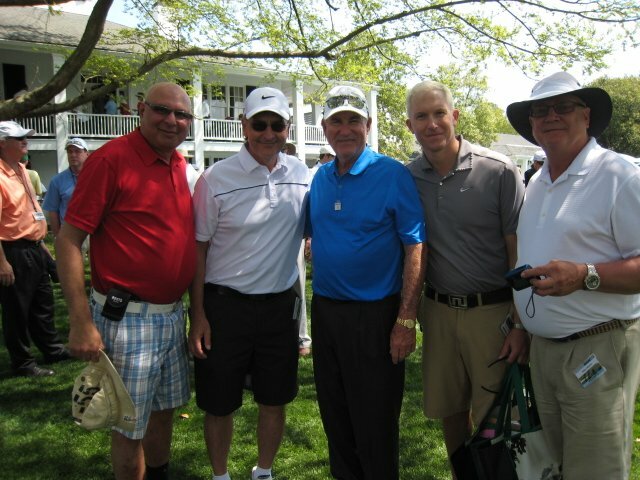 According to Augusta Chronicle (April 7 2013), “… practice round tickets were ranging from as low as $350 for Monday, to more than $1,000 for Wednesday, ticket brokers said. A four-day tournament badge was going for about $6,500 but … prices can fluctuate wildly on any given day.” The law also sets a 2,700-foot boundary around the venue where no tickets can be resold. 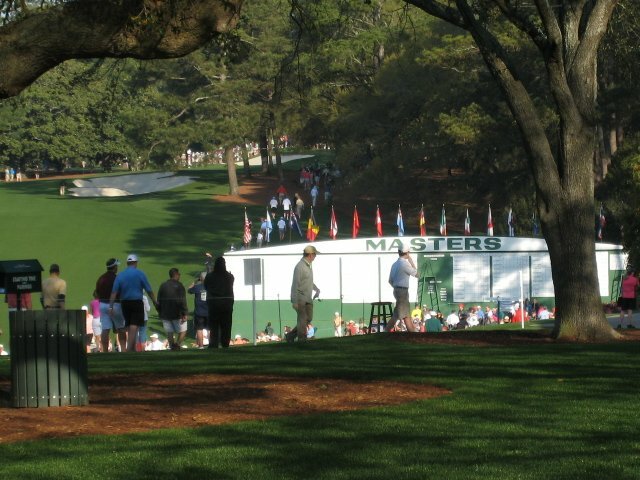 Augusta National policy prohibits the resale of Masters tickets.